Sarasota Lawn Bowling Club is the host for the Bowls USA 2017 US Open championship. The tournament runs November 11-18, 2017. Opening ceremony check in is at 1 PM. The opening ceremony runs from 2 to 6 PM. Cocktail party details to be announced. Late registration is available at Sarasota Lawn Bowling Club from 9 AM to 12 PM. Check in available from noon to 3 PM at Sarasota Lawn Bowling Club, 809 North Tamiami Boulevard, Sarasota, Florida 34236. The SLBC club greens are open for practice from noon to 5 PM. Practice is also available at Sun City Center Lawn Bowling Club. Check in available from noon to 3 PM at Sarasota Lawn Bowling Club, 809 North Tamiami Boulevard, Sarasota, Florida 34236. The club greens are open for practice from noon to 5 PM. Registration will go fast this year. Please make sure you have Registered and Paid for you and your entire team or you will not be confirmed. Registration may close prior to closing date due to enrollment. Click here to view lists of entrants by event. Special rates have been made available at a variety of local hotels. Please take advantage of a hotel that fits your needs and budget. Players will receive a US Open Shirt sponsored by Taylor Bowls, the official bowls manufacturer of the US Open. For more information on Taylor Bowls go to www.taylorbowls.com or contact Daniel Jittu: 407.529.9886 or usataylorbowls@gmail.com. Order now and have a new set delivered to you at your home or at the US Open. Join us at Sarasota Lawn Bowling Club for the grand finals andclosing ceremonies of the Bowls USA 2016 US Open tournament. FREE EXPO ~ Bring the Family! The Sarasota Municipal Auditorium hosts Health & Lifestyle Expo with 30+ businesses showcasing products and services. There will be daily speakers, performances and interactions for all ages. Some sponsor tables are still available. Contact Alin Lozada Info@ChFunding.com or Tim Mitten FullMoonPromollc@gmail.com. Visit the Bowls USA 2016 US Open website for more information about the week-long tournament. Join us at Sarasota Lawn Bowling Club for the opening ceremonies and welcome party for the Bowls USA 2016 US Open tournament. 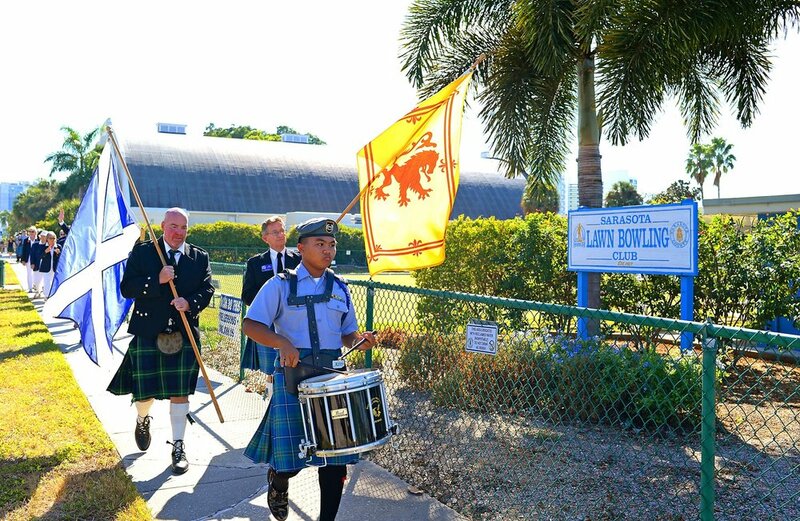 Bagpipers from the Riverview High School Kiltie Marching Band and the Sarasota Military Academy plus the SMA Color Guard perform at the opening ceremonies. The pipers are a tribute to the importance of the Scottish community in the development of lawn bowling as a local and world sport. See blog article, "Bagpipers to play at opening ceremonies," for more information. John Russo, a local singer and entertainer, will sing the US national anthem at the opening ceremonies and perform at the welcome party. Sarasota Lawn Bowling Club is the host for the Bowls USA 2016 and 2017 US Open championships. The tournament runs November 12-19, 2016. See Events, Entrants & Locations for more information about dates, times, and locations of competition events.